Provide comfort for the family of Sr. Eleanor Grace Spiridilozzi with a meaningful gesture of sympathy. Sister Eleanor Grace (Helen) Spiridilozzi, age 88, went peacefully home to God on Friday, December 21, 2018 at the Franciscan Villa. She was a Sister of Saint Francis for 70 years. Sister received a Bachelor’s Degree in Social Studies and History from LeMoyne College in Syracuse, NY, a Master’s Degree in History from Marywood College in Scranton, PA, and Certification in Counseling from St. Joseph’s College in West Hartford, Connecticut. Sister was principal and teacher in schools in the states of NY and NJ for 35 years. 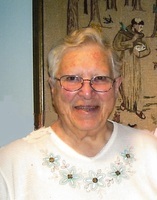 She was also Director of Religious Education in parishes in NY, NJ, and Connecticut for 16 years, Director of Volunteers at Rosewood Heights Health Center, Director of Senior Sisters Activities and Visitor Coordinator of the Saint Mother Marianne Shrine. Sister Eleanor Grace will be remembered in the hearts of those who knew and loved her for her warmth and caring and for her years of love, devotion and dedicated service to her community and to the field of education. She was very effective and enthusiastic in bringing people to or back to the Catholic Faith in the RCIA programs. But the program most near and dear to her heart was the telling of the story of St. Marianne to visitors at the shrine. Sister was predeceased by two brothers, Frank and Jerry Spiridilozzi; two sisters, Jennie Chesebro and Mary Pontera; and her brother-in-law, Angelo Simone. She is survived by sisters, Lucy Simone and Sister Jacqueline Spiridilozzi, OSF; many nieces and nephews; and the Sisters of Saint Francis. Cremation has been requested by Sister. Calling hours will be 9:15 am to 10:45 am, Saturday, December 29, 2018 at the Franciscan Villa followed by a Memorial Mass at 11:00 am. Committal of the cremains to follow at Assumption Cemetery. We encourage you to share your most beloved memories of Sr. Eleanor Grace here, so that the family and other loved ones can always see it. You can upload cherished photographs, or share your favorite stories, and can even comment on those shared by others.